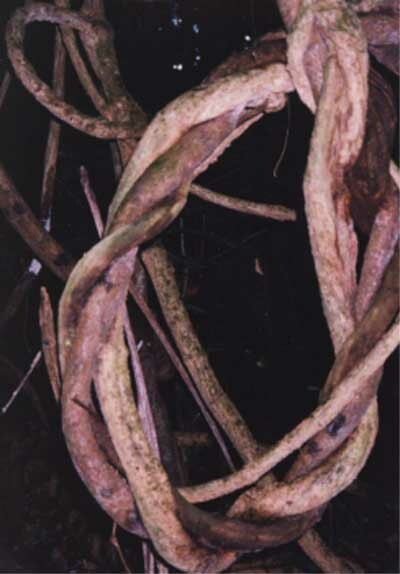 Due to their manner of growth, lianas grow in almost any direction, responding rapidly to changes in the local environment. Hence it is common to see them forming knots, braids, loops and circles. 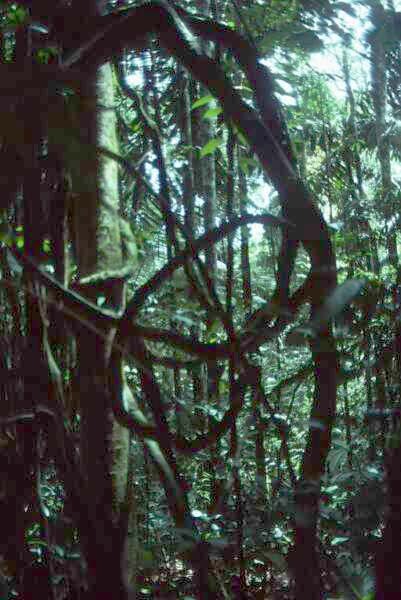 These shapes and forms add much to the "jungle" feel of tropical rainforest. They add to the overall complexity of the habitat, which favors the evolution of more species. This liana seemed to have no idea what direction to grow in. Eventually, lianas do reach the upper canopy where they put out leaves and flowers. But on the forest floor all you see is the stem, which will grow thick as a small tree trunk. The absence of leaves and flowers at ground level makes lianas notoriously difficult to identify in the field. It's difficult to see how this liana could have grown naturally, but it did! Presumably three stems grew vertically, intertwining like strands of a cable. Then their host tree fell down and the strands looped to the right and began to grow vertically again but all this is pure conjecture.